Officially A Yuppie: Movie of the Month - "Bottle Rocket"
Movie of the Month - "Bottle Rocket"
Let's start 2012 off with a bang, shall we? The first "Movie of the Month" of the New Year is the first feature film directed by cult director, Wes Anderson. 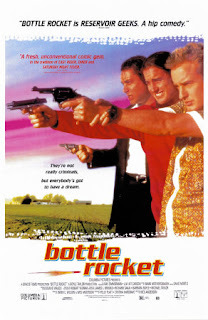 Based off his 1994 short film of the same name, the 1996 feature Bottle Rocket is a funny and charming picture about the worst heist and criminals ever written for the screen. The off-beat comedy stars brothers Owen and Luke Wilson, Owen had a hand in writing the film with Anderson and is about how brothers, Dignan and Bob (Owen and Luke Wilson respectively) stage grand robberies of small businesses in a small Texas town and try to befriend a major local criminal boss played by James Caan and attempt to pull off a big robbery that just goes everywhere but successful. Anderson begins using his ironic and subtle comedic voice to his first film, which received rave reviews in the festival circuit and kick started the careers of Anderson and his fraternal stars. The soundtrack, which features original composition by DEVO leader Mark Mothersbaugh only adds to the delight. One nerd composing for a team of nerds, it all works. VINTAGE CLIP! KANYE WEST Rapping at 19! VINTAGE CLIP - PULP on JOOLS HOLLAND! WATCH! LCD SOUNDSYSTEM Documentary Trailer! STREAM SNOW PATROL Live on LETTERMAN TONIGHT! LISTEN! LOST RADIOHEAD SONGS SURFACE! Guided by Voices on Letterman! Underrated Classic - Coldplay "X&Y"